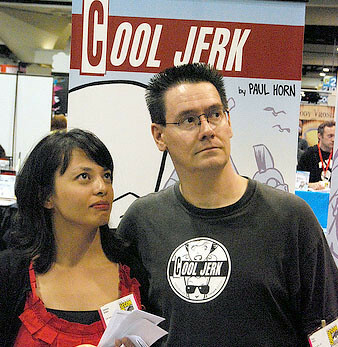 How to be Profiled | "I'm Not The Artist"
When I started helping my boyfriend— now husband— Paul Horn of Cool Jerk, exhibit at the San Diego Comic-Con in 2003, I wasn’t aware there was a network of significant others who support creators and artists. When we began exhibiting at other conventions outside of San Diego, I started seeing the same people who weren’t the artist or creator, but the support group. They were the ones helping set up, getting lunch, watching the kids and/or relieving the creator when a much-needed break was needed. I realized that it’s a much larger group that encompasses and affects our lives especially if it’s our livelihood. And we all share the common goal: to lend our support. The most common question asked of us is “are you the artist/creator?” So what came out of a frequently asked question is this website. So I need your help— do you have a suggestion for a future profile? Let me know.